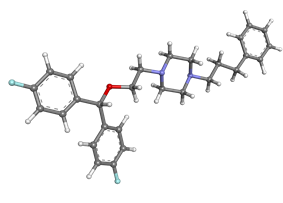 Vanoxerine (GBR-12909) is a piperazine derivative which is a potent and selective DRI. GBR-12909 binds to the target site on the DAT ~ 500 times more strongly than cocaine, but simultaneously inhibits the release of dopamine. This combined effect only slightly elevates dopamine levels, giving vanoxerine only mild stimulant effects. Vanoxerine has also been observed to be a potent blocker of the IKr (hERG) channel. Vanoxerine has been researched for use in treating cocaine dependence both as a substitute for cocaine and to block the rewarding effects. This strategy of using a competing agonist with a longer half-life has been successfully used to treat addiction to opiates such as heroin by substituting with methadone. It was hoped that vanoxerine would be of similar use in treating cocaine addiction. Research also indicates that vanoxerine may have additional mechanisms of action including antagonist action at nicotinic acetylcholine receptors, and it has also been shown to reduce the consumption of alcohol in animal models of alcohol abuse. Vanoxerine has been through human trials up to Phase II, but development was stopped due to observed QTc effects in the context of cocaine use. However, GBR 12909 analogs continue to be studied as treatments for cocaine addiction. As an example, GBR compounds are piperazine based and contain a proximal and a distal nitrogen. It was found that piperidine analogs are still fully active DRIs, although they don't have any affinity for the "piperazine binding site" unlike the GBR compounds. Further SAR revealed that while there are 4 atoms connecting the two fluorophenyl rings to the piperazine, the ether in the chain could be omitted in exchange for a tertiary nitrogen. Vanoxerine, a blocker of the dopamine carrier devoid of action on the noradrenaline carrier, while fully increasing dopamine in the nucleus accumbens, is ineffective in raising extracellular dopamine in the prefrontal cortex. Vanoxerine is a drug currently in phase IIb human trials for its use as an antiarrhythmic . It was previously indicated as a treatment for Parkinson’s Disease and depression, however it had no significant benefit with these diseases. Vanoxerine is now being investigated for its potential benefits in treating cardiac arrhythmias. Vanoxerine is a potentially effective treatment for cardiac arrhythmias. A significant cause of cardiac arrhythmias is reentry, an electrophysiologic event in which the proliferating signal that refuses to terminate, and endures to reexcite the heart after the refractory period. It is likely that vanoxerine acts to prevent reentrant circuits. Vanoxerine terminates atrial flutters and atrial fibrillations (both cardiac arrhythmias) by blocking the recirculating electrical signal, and preventing the reformation of the reentrant circuit. Vanoxerine has also shown a tendency to reduce the recurrence of cardiac arrhythmias, as it was exceedingly difficult to reproduce an atrial flutter or fibrillation in a subject that had been taking vanoxerine. Experiments have successfully been performed on cell cultures, canine hosts, and testing has moved towards human trials. In clinical human trials with increasing dosages, vanoxerine has shown to have a highly favourable therapeutic index, showing no side effects at concentrations much higher than the therapeutic dose. In canines, the effective therapeutic dose was between 76 ng/ml and 99 ng/ml, however the drug reached plasma concentrations of 550 ng/ml without harmful side effects, presenting a desirable therapeutic index. One of the major benefits of vanoxerine is that it does not appear to cause the same harmful side effects as its most comparable contender, amiodarone. At a cellular level, vanoxerine acts to block cardiac ion channels. Vanoxerine is a multichannel blocker, acting on IKr (potassium), L-type calcium and sodium ion channels. By blocking these specific channels, there is a prolongation of the action potential of the cell, preventing reactivation by a reentrant circuit. The block is strongly frequency dependant: as the pacing of the heart increases so does the frequency of ion channel blocking by vanoxerine. At this time, little is known about the molecular mechanism of vanoxerine, and steps are being made towards understanding how vanoxerine operates on a molecular level. ^ Singh S. Chemistry, Design, and Structure-Activity Relationship of Cocaine Antagonists. Chemistry Reviews, 2000. 100(3): 925-1024. ^ a b c d Cakulev, I; Lacerda, AE; Khrestian, CM; Ryu, K; Brown, AM; Waldo, AL (November 2011). "Oral vanoxerine prevents reinduction of atrial tachyarrhythmias: preliminary results". Journal of cardiovascular electrophysiology 22 (11): 1266–73. ^ Vetulani J. Drug addiction. Part III. Pharmacotherapy of addiction. Polish Journal of Pharmacology. 2001 Sep-Oct;53(5):415-34. ^ Preti A. New developments in the pharmacotherapy of cocaine abuse. Addiction Biology. 2007 Jun;12(2):133-51. ^ Szasz BK, Vizi ES, Kiss JP. Nicotinic acetylcholine receptor antagonistic property of the selective dopamine uptake inhibitor, GBR-12909 in rat hippocampal slices. Neuroscience. 2007 Mar 2;145(1):344-9. ^ Kamdar NK, Miller SA, Syed YM, Bhayana R, Gupta T, Rhodes JS. Acute effects of naltrexone and GBR 12909 on ethanol drinking-in-the-dark in C57BL/6J mice. Psychopharmacology (Berlin). 2007 Jun;192(2):207-17. ^ Søgaard U, Michalow J, Butler B, et al. (1990). "A tolerance study of single and multiple dosing of the selective dopamine uptake inhibitor GBR 12909 in healthy subjects". International clinical psychopharmacology 5 (4): 237–51. ^ Preti A. Vanoxerine National Institute on Drug Abuse. Current Opinion in Investigational Drugs. 2000 Oct;1(2):241-51. ^ Gorelick DA, Gardner EL, Xi ZX. Agents in development for the management of cocaine abuse. Drugs. 2004;64(14):1547-73. ^ Herman BH, Elkashef A, Vocci F. Medications for the treatment of cocaine addiction: Emerging candidates. Drug Discovery Today: Therapeutic Strategies. 2005 Spring;2(1):87-92. ^ Rothman, RB; Baumann, MH; Prisinzano, TE; Newman, AH (2008). "Dopamine Transport Inhibitors Based on GBR12909 and Benztropine as Potential Medications to Treat Cocaine Addiction". ^ Runyon, SP; Carroll, FI (2006). "Dopamine transporter ligands: recent developments and therapeutic potential". Current Topics in Medicinal Chemistry 6 (17): 1825–43. ^ Glenn, Brandon. "Drug developer ChanRx closes series A investment, hires CEO". MEDCITY News. Retrieved 11 March 2012. ^ a b c d e Lacerda, AE; Kuryshev, YA; Yan, GX; Waldo, AL; Brown, AM (March 2010). "Vanoxerine: cellular mechanism of a new antiarrhythmic". Journal of cardiovascular electrophysiology 21 (3): 301–10. ^ Mahmud, F; Shiozawa, N; Makikawa, M; Nomura, T (June 2011). "Reentrant excitation in an analog-digital hybrid circuit model of cardiac tissue". Chaos (Woodbury, N.Y.) 21 (2): 023121. ^ Matsumoto, N; Khrestian, CM; Ryu, K; Lacerda, AE; Brown, AM; Waldo, AL (March 2010). "Vanoxerine, a new drug for terminating atrial fibrillation and flutter". Journal of cardiovascular electrophysiology 21 (3): 311–9.